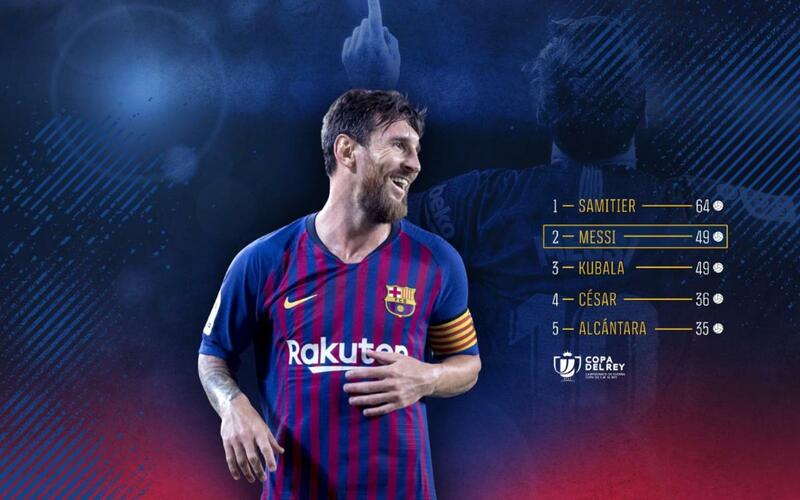 Lionel Messi reached yet another new milestone by moving into second place on Barça’s all-time scoring list in the Copa del Rey after scoring a goal in Thursday’s match against Levante. Messi now has 49 Copa del Rey goals, equaling/surpassing László Kubala. Barça’s all-time leader in Copa del Rey goals is Josep Samitier, who scored 64 for Barça between 1919 and 1932. Last Sunday, Messi reached the 400-goal plateau in La Liga. Notably, six of Messi’s Copa del Rey goals have come in finals played in 2009, 2012, 2015, 2017, and 2018. Barça won the title each time. In total, Messi has hoisted six Copa del Rey championships with Barça, in 2008/09, 2011/12, 2014/15, 2015/16, 2016/17, and 2017/18.